The Mayan calendar will come to a close on 22nd December 2012. As a father of twins who will be 6 years old on that very same date I am not, unsurprisingly, anticipating the day with relish. I expect there will be much of the usual alarmist nonsense about the end of the world in the media, and that is not something I wish for my children to see on their birthday. Nevertheless, they are twins, and the Mayan civilisation has a wonderful creation myth involving twins, so there is something that can be salvaged from the occassion. The mythologies of the Mayan civilisation are recorded in a book written shortly after the Spanish conquest of the region. 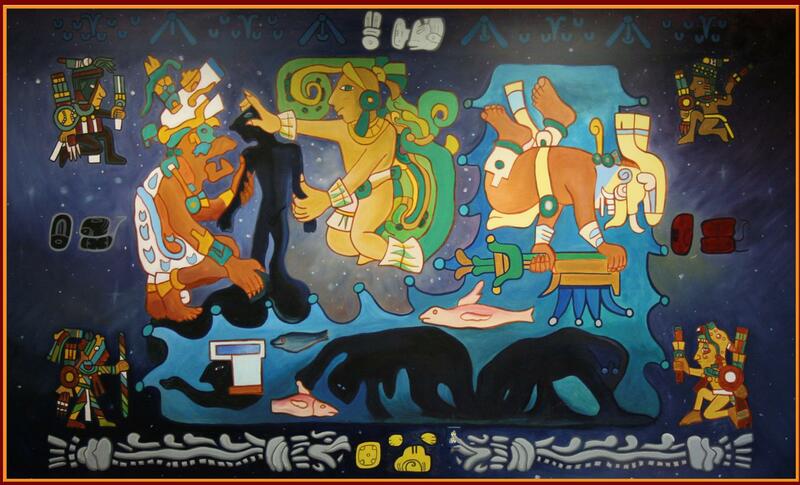 Written by a Quiche Indian in roman script, the Popol Vuh was translated by a Dominican priest in the 17th century and thereafter became the primary source for many Mayan mythological stories. The creation myth of the mayan civilisation has many similarities to those of other countries and cultures from around the world and because of this it is therefore claimed to be part of an ancient tradition of wisdom, a recording from the collective unconscious of humanity. Surprisingly like an account from modern physics the universe was thought to have been born from the emptiness of space. Hunab Ku, the first cause, divine, undying, boundless God is said to have awoken from a sleep in the waters of space and from there emanated the Heart of Heaven. From the Heart of Heaven arose the God 7, a demiurge essence with seven manifestations who in turn created the skies, chaos and the underworld. From this act of creation substances materialised, paired as opposites, attracted each other, merged and synthesised, and balanced their qualities until something new was created. The human race was born with the materialization of the regal parents Ixpiyacoc and Ixmucane, the parents of the divine twins Hanahpu 1 and Hanahpu 7; each of which represented perfection and the highest qualities and aspirations of the world. They were divinely innocent, acting without anger, pride or malice, and occupied themselves playing a ball game that represented the planets of the known universe. Such was their excellence at this sport that they attracted the envious attention of the lords of Xibalba, the Mayan underworld. Exemplifying the exact opposite qualities of the divine twins the lords of the underworld challenged the twins to a game with the sole intention of killing them. The twins accepted and on telling the lords their names, which the maya believed held the power of telepathy, the twins' inner most thoughts were revealed. The lords used their insight to torment the twins before the game and then cheated, beating the twins and decapitating them. Their bodies were buried in the ball court of Xibalba, and the head of Hanahpu 1 was hung on a calabash tree as a warning to anyone else who dared venture into the underworld. This is not the end of the story however, as the virgin daughter of one of the lords, Blood Woman, became curious about the abject acts of her parents. She decided to visit the calabash tree to see Hanahpu 1's head for herself and, when attempting to touch it, was alarmed as the head spat at her. By these means Blood Woman became pregnant, bringing dishonour on her parents and a death sentence upon herself. Ordered to kill the daughter and remove her heart two servants took her into the forest and, unable to perform the gruesome task, set her free. Blood Woman, knowing Hanahpu 1 to be the father of her child then sought out the home of his mother, Ixmucane, who on receiving her at her house refused to believe what she was saying. Taking pity on the woman she took her in as a servant and her life was spent in drudgery until the birth of her twin children. The twins Hunahpu and Ixbalamque were treated miserably by their grandmother and their older half-brothers. They were removed from the house for crying and placed upon an anthill and brambles by their brothers. The attempt to kill them was unsuccessful and despite the strength of the envy felt by their brothers they grew up to be strong and to have many powers, though the grandmother hid from them the ball game that had caused the death of their father. They achieved many marvellous feats in their lifetime, including tricking their half-brothers into climbing a tree that grew higher and higher; trapping them in an arboreal snare and then turning them into Monkeys. They were also responsible for the punishment of Itzam Ye (Venus) for the sin of pride, and aided the Mayan God Huracan in his dealings with Vucub Caquix and his children the creators and destroyers of mountains. After dispatching their half-brothers the twins used their supernatural powers to assist their grandmother with her chores, gathering a whole days wood with one swing of an axe. The work however was found to be undone the following day, and the animals of the forest found to be the culprits. Hanahpu and Xbalanque repeated the task and then hid themselves away waiting to ambush the creatures. The rat was the only animal caught and cunningly brokered his freedom by revealing the location of their father and uncle's playing equipment. Very soon the twins became the equal of their father and uncle in the celestial sport. They played with such vitality that, just like their fathers, they were summoned to the underworld to play with the lords of Xibalba. Fortunately the second set of twins were not as innocent as the first and through cunning and sharp wits they learnt the names of the lords, just as the lords had learnt the names of their father and uncle, and were able to escape all of the tricks that were put before them. The twins eventually lost the first game on purpose and were condemned to the Xibalban House of Knives where it was thought they would perish. Again the twins evaded the fate planned for them, persuading the knives to stop moving and sending leaf cutter ants to appease the underlords with gifts of flowers. The twins played game after game, losing each time so that they could be sent to the various houses of Xibalba. Cold house, jaguar house, and fire house were all visited and each time the twins were able to rest the night without being harmed. When, however, Hanahpu was beheaded by a bat in the last remaining test his brother refashioned a new head for him from a gourd and the twins then went on to play and win a final game. Seemingly on the point of victory the twins then tricked the chthonic gods by saying that the only way to kill them was to grind their bones to dust and to throw the remains into a river. In a seeming act of suicide they then acceded to being put into the fire of a specially constructed oven; from which the lords retrieved them, and from which they were then ground to dust and disposed of as instructed. The demise of the twins was only momentary though, and the twins were reincarnated as a catfish which then, unbeknownst to the underlords, evolved into two magical infants. The magical children travelled far and wide performing many unbelievable tricks until they were again invited to the underworld to perform for the gods. The most amazing of the tricks they performed in the underworld involved one of the twins chopping up the body of the other and then throwing the pieces into the air. The pieces quickly disappeared, only to reappear before the lords a short while later reconfigured. The lords were so impressed with this act that they insisted the boys perform the trick on them. One by one the lords were chopped into small pieces, and only promised to return them to their usual form if they agreed to a number of conditions. The lords agreed and were thereafter bound to never harming a living being, and to never stepping on the earth again. The defeat of the underlords is therefore reminiscent of the reincarnation and resurrection seen in many other mythologies from around the world. The twins then exhumed the bodies of their father and uncle and brought them back to life. They built a ball game temple from which sprouted the Tree of the World, its roots pushing down into Xibalba and its branches pushing up into the heavens. The realm of chaos became the world and the three divisions of the spiritual universe were finally accomplished. Hanahpu and Xbalanque ascended the World Tree and took their place in the heavens as Sun and Moon.